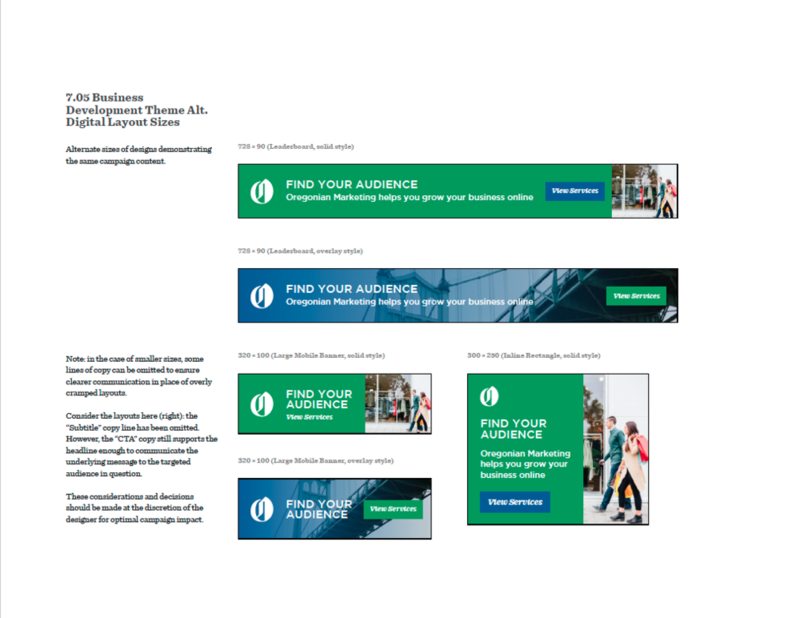 Oregonian Marketing, the marketing arm of The Oregonian, needed to develop advertising style guides to ensure brand consistency across all channels, as well as standardize and simplify ad creation. In addition, they wanted ideas for a new B2B campaign, plus tagline development for B2B and B2C audiences. Working with the design team at Isolary, we reviewed their most recent advertising, available research, and the existing brand guidelines. Working from that foundation, we developed two complementary color palettes and font styles for B2B and B2C. Both types of ads, we reasoned, should be recognizable as representing The Oregonian, yet distinctive enough for the intended audiences when viewed side by side. We also updated their logo usage rules, and provided layout guidelines to streamline ad production. Then we developed tone and voice guidelines to shape future ad copy for both B2B and B2C. The final piece included multiple taglines for both markets, and creative campaign development, including print and digital, email, radio scripts and SEM.